Mathematics illuminates the patterns that abound in our world. The Math Midway is a traveling exhibition, created by an energetic group of math enthusiasts working to establish America's only museum of mathematics. We are well on our way to becoming a world-class, permanent, public, hands-on museum. The Math Midway exhibition provides an interactive, hands-on tour of mathematical concepts, using a carnival style. The individual exhibits include exciting and surprising activities that relate mathematical principles to games and events you would find at a typical carnival, fair, or circus. For information on hosting the exhibition, click here. 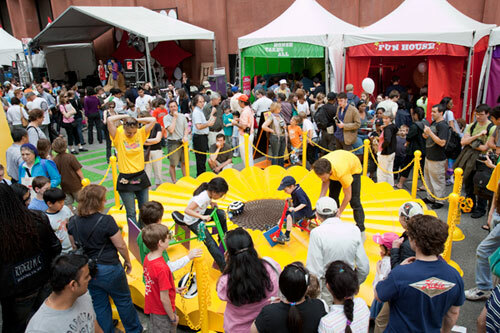 Debuting in June, 2009 at the World Science Festival Street Fair in New York City, the Math Midway has since delighted families and school groups throughout the country. The Math Midway is the first exhibition of the Museum of Mathematics. The mission of the museum is to enhance public understanding and perception of mathematics. Dynamic exhibits and programs will stimulate inquiry, spark curiosity, and reveal the wonders of mathematics. Through these activities, a broad and diverse audience will understand the evolving, creative, human, and aesthetic nature of mathematics. For more information about the ongoing development of America's only museum of mathematics, or to join our effort, visit MoMath.org. The Museum of Mathematics is now open at 11 East 26th Street in Manhattan. Contact us today to learn even more.